Moshe Friedman got his fifteen minutes of fame last year when, together with five other Neturei Karta men, he arrived in Tehran to attend the Holocaust denial conference. 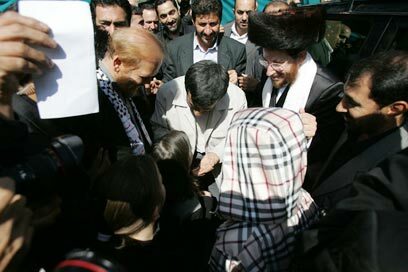 The photo of the traditionally-dressed Jewish man hugging Iran's President Mahmoud Ahmadinejad was published across the world and the backlash was severe: the six members of the Jewish delegation were boycotted by the Satmar Hassidim and were outcast by their communities in New York and Antwerp. Finally, all but one - Moshe Friedamn - apologized. This week, Friedman arrived for another visit with his friend Ahmadinejad. The two met Saturday night and Friedman, in his Shabbat attire, delivered a message of peace for Jews and Muslims. 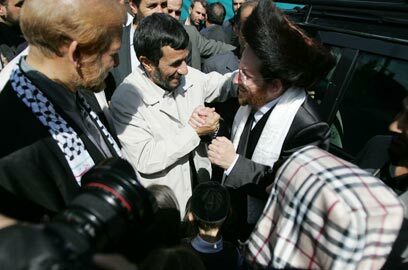 Ahmadinejad said he shared Friedman vision about a day "when Jerusalem is free from Zionism, and Muslims and Jews will pray together." According to Yisrael Hirsch of Neturei Karta, Friedman is scheduled to appear on Iranian TV "to unequivocally clarify the different between Zionism and Judaism." See all talkbacks "Friedman is at it again"